Sustainability is one of the most important words of the last few decades. It is the main driver of many programs and initiatives in society, and arguably the most important challenge of our century. As a sustainability innovation and development organization it's important for everything we do, and the vision and foundation for all our work. But what is its real meaning, and how can we use it to get to where we want to? This article discusses why knowing what 'sustainability' means exactly is so important. We discuss problems with old definitions, explain the new SiD definition of sustainability, and what it empowers us to see, do and discover. When we started working on 'integrated sustainability' over a decade ago, few people were aware of what sustainability was. The world was mostly concerned with internet economics, global political tension, and, as always, a large variety of gadgetry. The few professionals working in the sustainability field were almost exclusively academics with a profound understanding of the history and scientific basis of their field, and few others bothered with it. Since about 2004, the realities of our impoverished environment, social inequality, fragile economy, and unstable climate have brought 'sustainability' to the forefront of debates in almost all sectors. Inevitably, the word 'sustainability' since then is increasingly used in virtually every marketing story, political speech and product labeling, often entirely undeservedly, putting the word at risk of losing its meaning and power. At the same time, we see that many well intentioned 'sustainable' developments are not sustainable at all, often due to a lack of understanding of what it actually means. When we ask people what 'sustainability' means, we usually get a self-invented response. Something about making sure not to pollute, or being energy neutral... sometimes 'People, Planet, Profit' is mentioned. There seems to be little consensus on what it actually means to work on and apply sustainability. We see that the resulting confusion about what it is can cripple even the most well intentioned of trajectories. Most often, a common sense definition, sometimes even derived from a parable from our grandparents (or a Mexican fisherman), brings more clarity than existing academic theories. A great worry is that time has shown us a large amount of well intentioned measures that turned out to make things a lot worse than if nothing had been done at all. There are regulations on power saving, in the name of sustainability, that produce increased environmental toxicity, some recycling practices burden developing countries and hurt social equality, and a great many 'sustainability' certifications, labels and policies seem to simply invent their own reality, and hardly do any good. At the same time, virtually no-one seems to have the tools and methods available to separate the wheat from the chaff, so to speak, leaving these issues lingering and enabling less than pure motivations to sneak in and take advantage of the situation. This is not only due to the lack of a clear definition, of course, but the vagueness in understanding of the very foundation of sustainability is certainly a large part of the issue. After all, if few people really know what something is exactly, how could one protest to something for not being what it's claiming it is? This definition has inspired many, and has been instrumental at achieving the realization that sustainability relates to time and to people. It's been the source of insight for many that it is our children that will bear the consequences of our choices. Unfortunately, that's also what makes the definition hard to use, and, in the end, creates confusion and indecisive situations. We surmise that it was probably never written to be used so extensively as it is, but as a de-facto standard, it needs to be evaluated for what it has become. Let's look at why the Brundtland committee's definition is problematic. Firstly, this definition is not describing what sustainable development is, but what it should result in, which makes it not be an actual definition. This makes all the difference in trying to get to the heart of the sustainability issue, and trying to evaluate it. It's like trying to explain the rules of soccer by telling you the score of a match. In order to evaluate sustainability, the Brundtland comission definition misses quite a bit. Second, it's great to preserve options for future generations, but future generations do not have a voice. We can't call up the future to ask wether or not we did something right or wrong, so it's difficult to evaluate based on this definition. The last point, which may be trivial to some, but not to others, is that the definition is in regard to 'sustainable development', which to some is an oxymoron, rather than purely 'sustainability'. These, and several other issues, makes the Brundtland definition, while important, inspiring, and useful in some cases, not useful as a foundational definition, and a source of confusion and debate. When pitted against some of the more confusing issues of our time, or when used to solve difficult questions, the Brundtland comission's definition rarely creates clarity. Other definitions of sustainability exist, but often exhibit similar issues, mostly defining what sustainability should lead to or looks like, and rarely pintpointing what it actually is. While we were working on researching our own evaluation system for integrated sustainable practices, we found that we needed to fill this gap. Since 1999 we've been working on making an integrated approach to sustainability, which includes the full spectrum of topics, from energy, ecosystems and economy to social justice and systemic resilience. It needed to have a solid evaluation system to be able to test if what was worked on was actually the right direction. This system, called Symbiosis in Development (SiD), required us to dive into the deep end and to figure out how 'sustainability', as a word, could really be defined. Without it, the system would be built on shaky foundations. The SiD definition needed to be to the point, actionable and complete. The first part of the definition defines what sustainability is, actionable and testable. The second part exemplifies what the first part means when applied to our civilization. The second part isn't strictly necessary in a definition, but lends it color and inspiration. What does the SiD definition tell us? A unique part of the SiD definition is that it defines sustainability not as a physical constant, but as a state of a dynamic system. This means that sustainability is an edge condition of something that always moves, changes, grows, shrinks and acts in accordance to changes in its environment and internal composition. Defining it as such allows one to evaluate and work towards sustainability without locking oneself into static and rigid structures that may cause future issues. It puts sustainability in the realm of systems analysis and science, including network and complexity theory. This enables a myriad of new perspectives on how to achieve and work with sustainability, allowing many new innovative pathways to be explored. 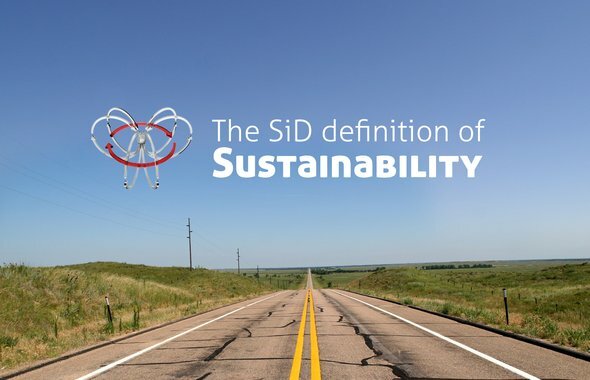 Another aspect of the SiD definition is that it defines sustainability as part of a system, with a system boundary. A system is a dynamic set of actors, relations and things, that exist with a spatial, temporal and contextual edge. Sustainability for our planet, for example, is something different than sustainability for a company, or city. It also means that sustainability has not only a spatial boundary, but also one in time. Something is 'sustainable' for a certain time frame. Sustainability is not about endlessness or development for eternal preservation, as all things have their beginnings and their end. It is about being able to continue to flourish, and remain doing so as long as possible, without endangering the system. What the definition will tell us, on close reading, is that an object, say a house, car or phone, in itself cannot be said to be sustainable (or not). The definition excludes the use of the word as an adjective to an object-noun. It simply makes no sense, because an object is not a system, and sustainability is the state of a system, of a set of relations. I like to say, as an example, that it's like the word 'love'. A car does not love, nor does a house or a single person. Love is an expression of a bond between things, a relation. So is sustainability, it's the state of a whole set of dynamic relations. The definition ensures, in the second part, with words like 'equitable', that a foundation for our actions often needs to be sought in the field of ethics, where physical measures are ambivalent and we are dealing with the complexities of human relations. This includes ethics, specifically the area of environmental ethics, in the debate. By attaching the word 'beautiful', in itself word that's nearly impossible to define, it ensures that our higher goals of happiness and artistic endeavour are carried along. 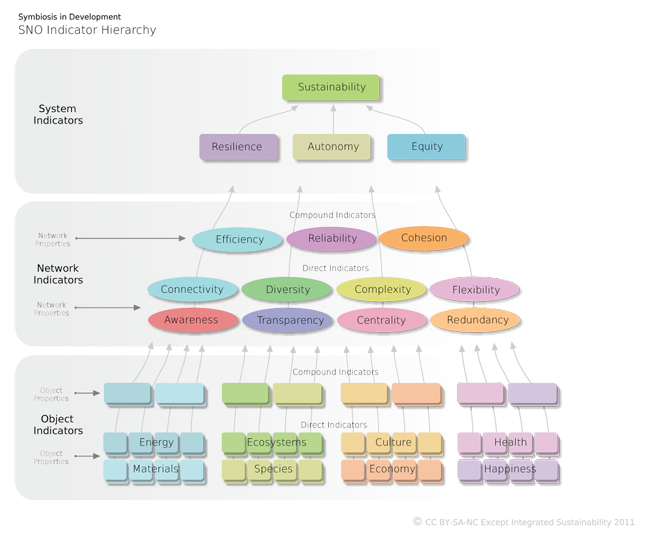 Eventually, using the SiD evaluation system, the definition lays the foundation for sustainability as being comprised of three core components, being Resilience, Autonomy and Equity. These properties of a system are fed by evaluating paramters that test on a wide variety of physical measures, such as energy, ecology, culture, economy and health and happiness (see the SiD ELSIA system), as well as a variety of network parameter sushc as transparency, diversity, complexity and redundancy. Below an example of a SiD indicator system (read more about the SiD methodology here). Together, the SiD definition, the SiD toolkit and evaluation system form a comprehensive understanding of what sustainability is, how it can be applied and worked with, and how we can both enable future generations with having the same opportunities as we have, as working on a beautiful, thriving and healthy society for today. The Cog in the Machine - article on system thinking and sustainability.